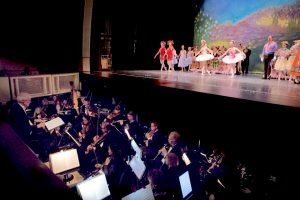 Nutcracker with Dance Kids of Monterey County – Monterey County Pops! Free, professional concerts for Monterey County. The traditional Friday morning performance entertaining 700 underserved children, is our gift to the community. Adults and children of all ages from the Monterey Peninsula and beyond enjoy the beauty of the Sunset Center and the opportunity to be captivated by the lure of Tchaikovsky’s music, performed by Monterey County Pops!, Andrea Paris Gutiérrez’s choreography, Joanne Phelps sumptuous costumes, and Nicole Bryant-Stephens magical sets. The age old story of ‘Nutcracker’ adapted to our own historic Monterey Peninsula demands a full-scale production complete with a full orchestra. The elaborate stage elements and intricate lighting unleash the viewers’ imagination by providing visual effects that are quite exciting. The Christmas tree that grows with Clara’s wish, the magical appearance of the Nutcracker Prince, the comic figure of Mother Ginger; the costume requires handling by three people once the actor is seated six feet above the stage floor — as well as the continuous flutter of the purest snowflakes which are swept up and conserved after each performance for reuse. The popularity of the Dance Kids of Monterey County’s ‘Nutcracker; A Monterey Peninsula Tradition’ is immense and as we celebrate our Silver Anniversary year, it provides an unforgettable spark to everyone’s holiday season. Monterey County Pops! is an orchestra dedicated to bringing pops and patriotic music performed by professional musicians free-of-charge to the families and visitors of Monterey County while identifying, engaging and educating under-served youth of Monterey County. Monterey County Pops! © 2019. All Rights Reserved.